Billed by Naxos as Works for Wind Volume 3, this release is probably the final instalment of their Hovhaness Wind music series and has been by far the longest in coming — recorded in early 2014, it has spent a leisurely four years on the Naxos 'conveyor belt'. Conductor Keith Brion has been the driving force behind this series which previously surveyed primarily the symphonies for wind band, namely Nos. 4, 7, 14, 20, 23 & 53. Now three conductors share the reins on remaining shorter and more descriptive band pieces interspersed with variously scored chamber works without conductor. The latter selections mostly blow away cobwebs from the list of hitherto unrecorded works — more about which later. As such, this release makes for an enjoyably eclectic, if not particularly logical sequence of pieces. More so than its two predecessors, this volume of shorts showcases several facets of Hovhaness' shifting techniques over five decades, although the music is not arranged chronologically. The disc is bookended by the composer's earliest published works for band from 1948. Both Tapor No.1 Op.14 (a hymn-like processional) and the Suite for Band Op.15 meld Renaissance-like counterpoint with an austere Armenian religious character. The Tapor will be familiar to some as the main material of "Heroic Gates of Peace", the closing movement of the composer's Symphony No.15 Silver Pilgrimage (1963). Mountain Under the Sea, Op. 392 (1984) is an enchanting 3-minute affair scored for a quintet of alto saxophone, harp, vibraphone, timpani and tam-tam, lending the work an immediately seductive veneer. A sinuous, modal oration by saxophone floats above a sparse tapestry of almost Webern-like pointillisms, which on closer inspection reveal tightly controlled ostinati and the odd twelve-tone row. Hovhaness's highly individual usage of overlapping ostinati and isorhythm to generate sections or entire movements was at its zenith in the early 1950s, when he also flirted with 12-tone rows, so despite the high opus number I would guess we are hearing 1954 Hovhaness here. The scoring is also identical to 1954's The Flowering Peach, previously recorded by Keith Brion for the Delos label, and the performance here sounds nearly as iridescent and haunting. Vision of a Starry Night Op. 384 (1985) is a nocturnal barcarole for flute, harp and xylophone rearranged from the last movement of the composer's 1981 piano sonata 'Ananda'. With its central section scored for xylophone it segues nicely into the disc's next work. October Mountain, Op. 135 (1942 & 1951) for percussion sextet has several previous recordings (including one by Leopold Stokowski), something of a testament to its once high standing in the percussion repertoire. Sounding far more like 1951 than 1942 Hovhaness, the composer employs different groupings of the ensemble to create five varied, sparsely-textured and fleeting mood pieces that cross freely from sonoristic to melodic writing, including purely decorative twelve-tone lines on glockenspiel. It works very well, and seems over all too soon. Hymn to Yerevan, Op. 83 (1969) honours the ancient Armenian capital at the foot of Mt. Ararat. The music, adhering to an ancient Armenian Church mode, traverses solemn hymnal writing, motet-like counterpoint as well as the sliding trombone canons and cataclysmic bell sections characteristic of late 1960s Hovhaness. Brion made the premiere recording of this work in the late 1960s, so is on familiar terrain here, and gets a fine performance from his Central Washington University players. Meditation on Ardalus, Op. 156, No. 2 (c.1958) is a brooding work for solo flute with a livelier middle section. Hitherto unknown it was presented by Hovhaness to Keith Brion. It segues nicely into the insect-like clarinet chattering that opens (and closes) The Ruins of Ani, 'Lament for Ani, City of a Thousand Churches', Op. 250, No. 1 (1972). Here, an ensemble of eight clarinets extols an angst-ridden lament for the celebrated ancient Armenian city whose ruins are located in modern-day eastern Turkey. This is the premiere recording of a smaller sister-piece to the big-boned 'Ani' Symphony (No.23) which appeared in Volume 2 of this series. Overture to The Burning House, Op.185a (1962) is published also as a separate number to the Op.185 chamber opera it introduces. Hovhaness first worked on The Burning House in 1959 but in its final 1962 form it incorporates elements of Japanese Noh drama, although the protagonist is the Armenian god of courage Vahaken. The instrumental forces comprise just flute and percussion, and the work embodies a neo-Gagaku Japanese musical style, somewhat evident in this overture. Not only is this a premiere recording, but aside from Hovhaness's oft-recorded intermezzo Prayer of St. Gregory it is the only commercial recording of any music from a Hovhaness opera. Two small issues with this release relate to some inacurate recording information and omissions of repertoire. 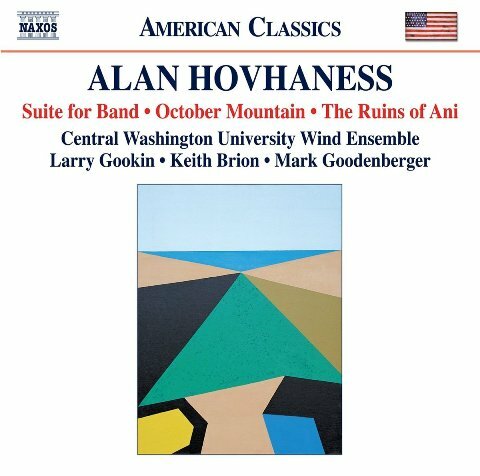 Firstly both Vision of a Starry Night and Ruins of Ani are not marked with an asterisk to denote that they are first recordings; conversely, Mountain Under the Sea should not be asterisked so, since the work featured in a 2007 CD released on the 'Arizona University Recordings' label, performed by the Lewis-Clark State College Chamber Players. However, given the limited distribution of a small, university-based label, Naxos can be forgiven this oversight. Secondly, the generous filling out of this disc (some 50%) with short chamber pieces might lead one to think that the three-volume series has surveyed the complete Hovhaness wind repertoire with room to spare. But in fact two significant wind band works unfortunately left out were the 25-minute Mountains and Rivers Without End and the 15-minute Requiem and Resurrection for "Brass Choir". Fortunately both are available elsewhere, and under Hovhaness's own direction. All in all, Hovhaness fans will be grateful for Keith Brion's considerable efforts in supervising this series and support of the composer, although some older fans probably have been for some years. Although best known for his New Sousa Band recordings, Brion's long-term support for Hovhaness stretches as far back as 1969 when his debut recording was an all-Hovhaness Mace LP of the composer's band music. And featured on that LP was a certain young principal trumpeter named Gerard Schwarz, then embarking on his own assocation with Hovhaness.